Population Ranked 45th in the U.S.
Delaware is a state located on the Atlantic Coast in the Mid-Atlantic region of the United States. While the U.S. Census Bureau designates Delaware as one of the South Atlantic States, most consider it to be a part of the Mid-Atlantic States and/or Northeastern United States. The state is named after the Delaware Bay and River, which were named for Thomas West, 3rd Baron De La Warr (1577–1618). Delaware was the first state to ratify the U.S. Constitution and is also distinguished as being a slave state that remained in the Union during the American Civil War. Delaware was the only slave state not to assemble Confederate regiments or militia groups on its own. Despite being the 45th most populous state, it is the seventh most densely populated state, with a population density of 320 more people per square mile than the national average, ranking ahead of states such as Florida, California, and Texas. The state of Delaware is 96 miles long and ranges from 9 to 35 miles across, totaling 1,954 square miles and making it the second-smallest state in the United States, after Rhode Island. 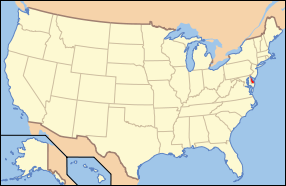 Delaware is bounded to the north by Pennsylvania, to the east by the Delaware River, Delaware Bay, New Jersey and the Atlantic Ocean and to the west and south by Maryland. Small portions of Delaware are also situated on the far, or eastern, side of the Delaware River Estuary, and these small parcels share land boundaries with New Jersey. The state of Delaware, together with the Eastern Shore counties of Maryland and two counties of Virginia, form the Delmarva Peninsula, a geographical unit stretching far down the Mid-Atlantic Coast. The Chesapeake and Delaware Canal extends across the northern part of the state to link Delaware Bay and Chesapeake Bay. The canal forms part of the Intracoastal Waterway. The definition of the northern boundary of the state is highly unusual. Most of the boundary between Delaware and Pennsylvania is defined by an arc extending 12 miles (19 km) from the cupola of the courthouse in New Castle, and is referred to as the Twelve-Mile Circle. Wilmington is the state's largest city and its economic hub. It is located within commuting distance of both Philadelphia and Baltimore. Despite Wilmington's size, all regions of Delaware have enjoyed phenomenal growth, with Dover and the beach resorts expanding immensely. Dover, in the center of the state, is the capital. Delaware is on a level plain; the highest elevation does not even rise 450 feet above sea level. The northern part is associated with the Appalachian Piedmont and is full of hills with rolling surfaces. South of Newark and Wilmington, the state follows the Atlantic Coastal Plain with flat, sandy, and, in some parts, swampy ground. A ridge about 75 to 80 feet in altitude extends along the western boundary of the state and is the drainage divide between the two major water bodies of the Delaware River and several streams falling into Chesapeake Bay in the west. Since almost all of Delaware is a part of the Atlantic Coastal Plain, the climate is moderated by the effects of the ocean. The state is somewhat of a transitional zone between a humid subtropical climate and a continental climate. Despite its small size (roughly 100 miles from its northernmost to southernmost points), there is significant variation in mean temperature and amount of snowfall. The southern portion of the state has a somewhat milder climate and a longer growing season than the northern portion. Furthermore, the transitional climate of Delaware supports a surprising variety of vegetation. At Trap Pond State Park in Sussex County, bald cypress grow; this is thought to be one of the northernmost stands of these trees. The vegetation in New Castle County, on the other hand, is more typical of that of the northeastern United States. All parts of Delaware have relatively hot, humid summers. 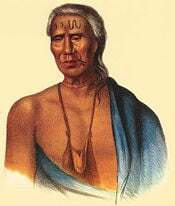 Lapowinsa, Chief of the Lenape, one of the Native American tribes that lived in the area that became Delaware. Before Delaware was settled by European colonists, the area was home to the Eastern Algonquian tribes known as the Unami Lenape or Delaware throughout the Delaware valley, and the Nanticoke along the rivers leading into the Chesapeake Bay. The Unami Lenape in the Delaware Valley were closely related to Munsee Lenape tribes along the Hudson River. They had a settled hunting and agricultural society, and they rapidly became middlemen in an increasingly frantic fur trade with their ancient enemy, the Minqua or Susquehannock. With the loss of their lands on the Delaware River and the destruction of the Minqua by the Iroquois of the Five Nations in the 1670s, the remnants of the Lenape had left the region and moved over the Alleghany Mountains by the mid-eighteenth century. A band of the Nanticoke tribe of Indians still remains in Sussex County. The Dutch were the first Europeans to settle in present-day Delaware by establishing a trading post at Zwaanendael, near the site of Lewes in 1631. Within a year all the settlers were killed in a dispute with Native Americans. In 1638, a Swedish trading post and colony was established at Fort Christina (now in Wilmington) by the Dutchman Peter Minuit at the head of a group of Swedes, Finns and Dutch. Thirteen years later the Dutch, reinvigorated by the leadership of Peter Stuyvesant, established a new fort in 1651, at present-day New Castle, and in 1655, they took over the entire Swedish colony, incorporating it into the Dutch New Netherland. Only nine years later, in 1664, the Dutch were themselves forcibly removed by a British expedition under the direction of James, the Duke of York. Fighting off a prior claim by Cæcilius Calvert, 2nd Baron Baltimore, Proprietor of Maryland, the Duke passed his somewhat dubious ownership on to William Penn in 1682. Penn strongly desired access to the sea for his Pennsylvania province and leased what then came to be known as the "Lower Counties on the Delaware" from the Duke. Like the other middle colonies, the Lower Counties on the Delaware initially showed little enthusiasm for a break with Britain. The citizenry had a good relationship with the Proprietary government and generally were allowed more independence of action in their Colonial Assembly than in other colonies. Nevertheless, there was strong objection to the seemingly arbitrary measures of Parliament, and it was well understood that the territory's very existence as a separate entity depended upon its keeping step with its powerful neighbors, especially Pennsylvania. 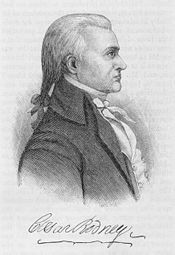 Caesar Rodney successfully led a much divided Delaware population through the revolutionary era. So it was that New Castle lawyer Thomas McKean denounced the Stamp Act in the strongest terms, and John Dickinson became the "Penman of the Revolution." Anticipating the Declaration of Independence, Patriot leaders McKean and Caesar Rodney convinced the Colonial Assembly to declare itself separated from British and Pennsylvania rule on June 15, 1776, but the person best representing Delaware's majority, George Read, could not bring himself to vote for a Declaration of Independence. Only the dramatic overnight ride of Rodney gave the delegation the votes needed to cast Delaware's vote for Independence. Once the Declaration was adopted, however, Read signed the document. Delaware provided one of the premier regiments in the Continental Army, known as the "Delaware Blues" and nicknamed the "Blue Hen Chickens." In August 1777, General Sir William Howe led a British army through Delaware on his way to a victory at the Battle of Brandywine and captured of the city of Philadelphia. The only real engagement on Delaware soil was fought on September 3, 1777, at Cooch's Bridge in New Castle County. It is believed to be the first time that the Stars and Stripes was flown in battle. Following the Battle of Brandywine, Wilmington was occupied by the British. The British remained in control of the Delaware River for much of the rest of the war, disrupting commerce and providing encouragement to an active Loyalist portion of the population, particularly in Sussex County. Only the repeated military activities of Caesar Rodney were able to control them. Following the American Revolution, statesmen from Delaware were among the leading proponents of a strong central United States government with equal representation for each state. Once the Connecticut Compromise was reached—creating a U.S. Senate and U.S. House of Representatives—the leaders in Delaware were able to easily secure ratification of the U.S. Constitution on December 7, 1787, making Delaware the first state to do so. In the 1790s, the mills along Brandywine Creek near Wilmington were the new country’s leading source of flour. In 1795, Delaware’s first cotton mill was established near Wilmington, and in 1802, Eleuthère Irénée du Pont de Nemours, a French immigrant, established a gunpowder mill. His firm, E.I. du Pont de Nemours and Company, supplied nearly all the military explosives used by the United States in its wars and evolved into one of the world’s largest chemical manufacturing firms, providing about 8,000 jobs. New transportation links in the early nineteenth century encouraged trade. The completion in 1829 of the Chesapeake and Delaware Canal, between Delaware Bay and Chesapeake Bay, stimulated shipping. Delaware’s first steam-driven railroad went into operation in 1832. 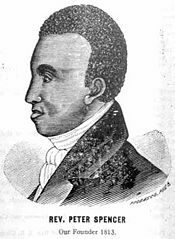 Peter Spencer, born a slave in Maryland in 1782, founded the first independent black Christian Church in Delaware in 1813, the A.U.M.P. Church. 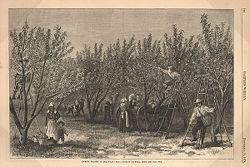 Many colonial settlers came from Maryland and Virginia, which had been experiencing a population boom. The economies of these colonies were largely based on tobacco and were increasingly dependent on slave labor. At the end of the colonial period, slavery in Delaware began a precipitous decline. Shifts in the agriculture economy, the efforts of local Methodists and Quakers, and greater governmental regulation were all factors. Attempts to abolish slavery failed by narrow margins. By the 1860 census there were only about 1,800 slaves in a state of 90,000 people, including nearly 20,000 free African-Americans. When he freed his slaves in 1777, John Dickinson was Delaware's largest slave owner with 37 slaves. By 1860, the largest owner had 16 slaves. The oldest black church in the country was chartered in Delaware by former slave Peter Spencer in 1813, as the "Union Church of Africans," which is now the A.U.M.P. Church. During the American Civil War, Delaware was a slave state that remained in the Union (Delaware voted not to secede on January 3, 1861). Delaware had been the first state to embrace the Union by ratifying the Constitution and would be the last to leave it, according to Delaware's governor at the time. While most Delaware citizens who fought in the war served in the regiments of the state, some served in companies on the Confederate side in Maryland and Virginia regiments. Delaware is notable for being the only slave state not to assemble Confederate regiments or militia groups on its own. Nevertheless, race relations have remained difficult. The state’s public schools were segregated by race until the Supreme Court of the United States struck down racial segregation in its 1954 decision, Brown v. Board of Education. But de facto segregation—racial imbalance of schools caused by residence patterns—continued to be a problem into the 1970s and beyond. In 1978, a federal court mandated the busing of students to achieve racial balance, which was ended in 1995, when it was found that the goals of integration had been achieved. Segregated housing was also common throughout the state until the federal government banned it in 1968. In the 1970s, the state legislature drew out-of-state banks' credit card operations to locate in Delaware by relaxing regulations on interest rates they charge their customers. Delaware has also become the corporate home of hundreds of major and minor corporations that take advantage of the state's unrestrictive incorporation law. In 1988, when many American businesses faced hostile corporate takeovers, the legislature enacted a law that makes it difficult to take over a Delaware corporation. 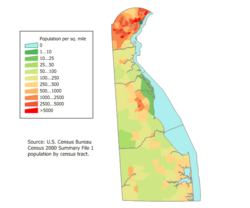 Population estimates by the Census Bureau for 2005 place the population of Delaware at 843,524. The five largest ancestries in Delaware are: African-American (19.2 percent), Irish (16.6 percent), German (14.3 percent), English (12.1 percent), Italian (9.3 percent). Delaware has the highest proportion of African-American residents of any state north of Maryland, and had the largest population of free blacks (17 percent) prior to the Civil War. As of 2000, 90.5 percent of Delaware residents age 5 and older speak only English at home; 4.7 percent speak Spanish. French is the third most spoken language at 0.7 percent, followed by Chinese at 0.5 percent and German at 0.5 percent. In 2006, legislation was proposed in Delaware that would designate English as the official language, though opponents deemed it unnecessary. The A.U.M.P. Church, the oldest African-American denomination in the nation, was founded in Wilmington and still has a very substantial presence in the state. Delaware's agricultural output consists of poultry, nursery stock, soybeans, dairy products and corn. Its industrial outputs include chemical products, processed foods, paper products, and rubber and plastic products. Delaware's economy generally outperforms the national economy of the United States. Dover Air Force Base, located in the capital city of Dover, is one of the largest Air Force bases in the country and is a major employer in Delaware. In addition to its other responsibilities, the base serves as the entry point and mortuary for American military persons (and some U.S. government civilians) who die overseas. The state does not assess sales tax on consumers. The state does, however, impose a tax on the gross receipts of most businesses. Delaware does not assess a state-level tax on real or personal property. Real estate is subject to county property taxes, school district property taxes, vocational school district taxes, and, if located within an incorporated area, municipal property taxes. State Capitol building in Dover. The city of Dover is the capital and second largest city in Delaware. 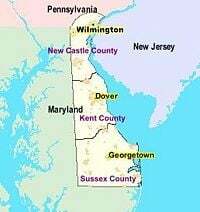 It is also the county seat of Kent County, and the principal city of the Dover, Delaware Metropolitan Statistical Area which encompasses all of Kent County. It was founded as the court town for newly established Kent County in 1683 by William Penn, the Proprietor of the territory generally known as the "Lower Counties on the Delaware." Later, in 1717, the city was officially laid out by a special commission of the Delaware General Assembly. The capital of the state of Delaware was moved to Dover from New Castle in 1777 due to its central location and relative safety from British raiders on the Delaware River. Dover is located on the St. Jones River in the Delaware River coastal plain and as of July 2006, had an estimated population of 34,735. Delaware's fourth and current constitution, adopted in 1897, provides for executive, judicial and legislative branches. The General Assembly consists of a House of Representatives with 41 members and a Senate with 21 members. Representatives are elected to two-year terms, while senators are elected to four-year terms. The executive branch is headed by the governor of Delaware. Delaware has three counties: Kent County, New Castle County, and Sussex County. Each county elects its own legislative body. The Democratic Party holds a plurality of registrations in Delaware. Until the 2000 presidential election, the state tended to be a bellwether state, sending its three electoral votes to the winning candidate for over 50 years in a row. Bucking that trend, however, in 2000 and again in 2004 Delaware voted for the Democratic candidate. Historically, the Republican Party had an immense influence on Delaware politics, due in large part to the wealthy du Pont family. As the DuPonts' political influence has declined, so has that of the Delaware Republican Party. The Democrats have won the past four gubernatorial elections and currently hold seven of the nine statewide elected offices, while the Republicans hold the remaining two. The Democratic Party gains most of its votes from heavily developed New Castle County, whereas the less-populated Kent and Sussex Counties vote Republican. ↑ The Graduate Center, City University of New York, American Religious Identification Survey. Retrieved September 21, 2008. ↑ Delaware Online, Delaware workers earn 7th-highest salary in U.S. Note: value of $937 per week was for the 4th quarter of 2005. Retrieved December 13, 2007. ↑ Delaware Online, DuPont cuts jobs to grow seeds. Retrieved December 13, 2007. ↑ U.S. Census Bureau, Population Division, Population Estimates for All Places: 2000 to 2006. Retrieved September 21, 2008. Delaware Living. History. Retrieved September 21, 2008. Heinegg, Paul. Free African Americans of Maryland and Delaware. Retrieved September 21, 2008. Kolchin, Peter. 1993. American Slavery, 1619-1877. New York: Hill and Wang. ISBN 9780809025688. Riordan, Liam. 2007. Many Identities, One Nation: The Revolution and its Legacy in the Mid-Atlantic. Philadelphia: University of Pennsylvania Press. ISBN 0812240014. Schama, Simon. 2006. Rough Crossings: Britain, the Slaves, and the American Revolution. New York: Ecco. ISBN 9780060539160.